Disney Princess is a licensed theme initially released in March 2012. Originally it was aimed at girls aged 2–5 and designed using DUPLO elements and figures. The first wave consisted of four sets; the second wave, which was released in 2013 consisted of two. The third wave of sets, released in 2014, was aimed at somewhat older girls (aged 5–12), so the sets used System bricks and mini-dolls, although one DUPLO set was released at the same time. In 2015, both the System and DUPLO lines of the theme will receive 4 new sets each. 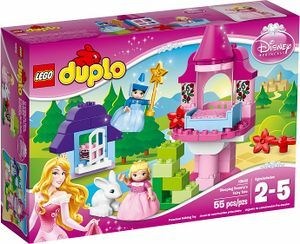 The DUPLO sets mainly follow main events in the stories of the princesses known from the Disney animated feature-lenght movies before the Disney renaissance, with the exception of Ariel's sets. Each set depicts a scene from the film. All of the sets have some sort of location in them. The DUPLO sets colour vary, light pink, azure, lavender and purple being the main colours. There have been overall 8 new DUPLO Figure's released in this theme (7 if you don't count Ariel's second variation). 5 of the figures are princess, 2 other are princes. Merryweather, is the only non royal figure. All of the females except Ariel's mermaid variation comes with a new cloth dress piece which goes over their legs. Sofia and Amber are set to appear in 2015, the new princesses are shorter and have a shorter dress cloth piece. Along with the DUPLO figures, there have been 3 animals in the line, Flounder, a rabbit and a horse. Clover and Sofia's Pegasus, Minimus are set to appear also. The theme also released two characters on printed bricks, one with Merryweather (who was later redesigned to a figure in 2014, and the other with Sebastian. A system set, 41055 Cinderella's Romantic Castle. The System sets have alot more colour in them then the DUPLO sets, lavender, cream, white, light pink purple, gold, pink, light grey, azure and light blue being main colours. Lemon, transparent blue and brown will be used more in 2015. Like the DUPLO line the sets are based on some of the main parts in the princess'es stories. Most of the sets have the princesses palaces. The first wave of sets introduced four new female mini-doll figures; like her DUPLO counterpart, Ariel has two variations, as did Cinderella has two as well. Rapunzel and Merida substituted Snow White and Auora, as the two new princesses. The theme also has three male mini-dolls, two from the DUPLO theme; Prince Charming, Prince Eric and a new character Eugene Fitzherbert better known as Flynn Rider. These figures were accompanied by a variety of animals. A variety of new moulds are used including well known moulds crab and clam moulds in 41050 Ariel's Amazing Treasures and a frog in 41052 Ariel's Magical Kiss. The theme also uses animal moulds from Friends, including: Cinderella's horse, Major which pulls Cinderella's carriage and Lucifer and Bruno make an appearance in Cinderella's castle. In 2015 sets will reuse a rabbit and a dolphin as well. Some new animal moulds will be introduced: Merida's three younger brothers - Harris, Hubert and Hamish - in their bear form, Flounder the fish, who is one of Ariel's best friends. Lastly it features Pascal the chameleon Rapunzel’s pet. As a result to this all sets will have an animal. Angus, Maximus and Cinderella's mice friends are notably missing from the theme. In 2015 no new male mini-doll figures débuted, but plenty of females did. Aurora was redesigned as a mini-doll. Jasmine débuted as the first non-Caucasian princess, along with Raja her tiger. Anna, Alana and Elsa joined the line up, despite not being official Disney princesses. Both Olaf and Sebastian are set to appear, as system scale sidekicks. The characters, despite appearing in separate films, and even different types of media entirely (in Sofia's and Amber's case) have distinct similarities. The princesses are all kind to animals, and have the common ability to communicate with them. The princesses are known for their inner and outer beauty, as well as having singing voices. Each official and teenage princess (except for Merida) has a romance that is resolved by the end of her debut film. LEGO has made three of these love interests- Prince Charming, Prince Eric and Flynn Rider. Snow White, Aurora, Ariel, Alana, Jasmine, Rapunzel, Merida, Amber, Anna and Elsa are born of royal heritage as daughters of kings and queens. Cinderella and Sofia became royalty by marriage. LEGO has added 5 princesses to the line up despite never appearing in the offical Disney princess licence: Anna, Alana, Amber, Elsa, and Sofia. Though Sofia and Amber have been seen in offical merchandise. Elsa and Anna are to be coronated as official Disney Princesses soon. The sets made in 2012 were based on the first three princesses, Cinderella, Snow White and Sleeping Beauty. In 2013 both sets were based on the fourth princess, Ariel. In 2014 sets included two new and more popular characters, Merida and Rapunzel, along with two princesses introduced earlier. 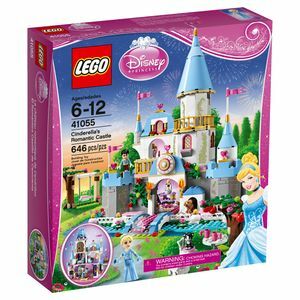 The new Cinderella's and Ariel's sets were redesigned using System bricks instead of DUPLO parts to suit the new mini-dolls which will substitute DUPLO figures. Though DUPLO characters were not unseen as Aurora revived another set. In 2015 new characters will continue to make appears in System and DUPLO, including unofficial princesses like Anna and Sofia. This is the only licensed theme aimed towards girls, and not both girls and boys like Harry Potter. The site and description portray Lucifer as friendly despite being a villain. Jessie and Minnie Mouse who have appeared in previous themes, have been included in Disney Princess merchandise.